Dark bags under the eyes can make an otherwise youthful-looking face appear old and tired. Many individuals who are aware of the negative cosmetic effect caused by under-eye puffiness opt to visit our leading Atlanta area facial plastic surgeon, Dr. Burke Robinson, to undergo lower eyelid surgery. At two convenient office locations in Atlanta, Dr. Burke Robinson meets patients to create and discuss an individualized surgical plan for removing the excess fat from the lower eyelids. Prior to surgery, Dr. Burke Robinson comprehensively discusses the lower eyelid surgery procedure with his patients. In this procedure, tiny incisions are made behind the lower eyelids, and fat is removed from them with small surgical forceps. This technique eliminates visible scarring. Dr. Robinson is careful to remove only the smallest amount of fat and skin necessary to create a natural, rested result. “The eye sockets have fat in them to cushion eyeballs so they are not banging into the bony eye socket rim,” explains Dr. Robinson. For this reason, it is important to choose a facial plastic surgeon experienced enough to leave the appropriate amount of fat in the eye sockets to protect the eyes. The incisions heal so well and rapidly behind the eyelid that no sutures are placed (and therefore removed). As a result, patients can enjoy the cosmetic benefits of lower eyelid surgery without visible scars. To learn more about the benefits and risks of eyelid surgery, visit our frequently asked questions page. Who is a Good Candidate for Lower Eyelid Surgery? Anyone with loose, drooping skin or excess fat in the lower eyelid region is a likely candidate for lower eyelid surgery. Patients should be in good health and must visit our Alpharetta or Dunwoody office to be examined by Dr. Burke Robinson prior to treatment to ensure that a successful aesthetic result will be possible. Based on the degree of sagging and puffiness around the eye, Dr. Robinson will create a treatment plan for each patient designed specifically for his or her face. Because not all patients age, in the same way, it is advisable to select a board-certified plastic surgeon who performs only facial cosmetic surgeries and has the expertise necessary to ensure that the functionality of the eye will be unaffected by lower eyelid surgery. Since no sutures are used, the recovery process is short and simple. Dr. Robinson gives each patient-specific instructions for at-home postoperative care and makes himself available at his Atlanta-area offices to patients who may have questions or concerns about their eyelid surgery recovery. 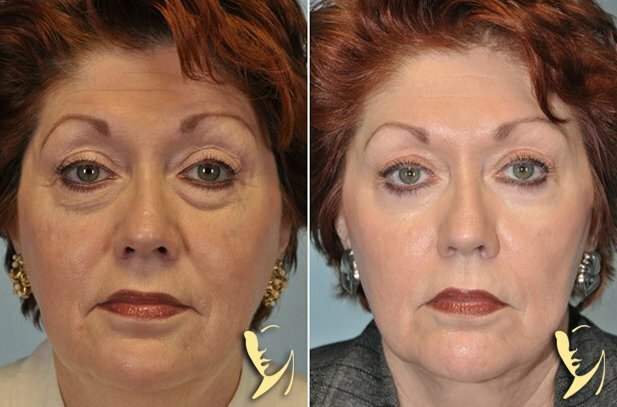 Patients are typically very pleased with their results and are often surprised by the dramatic difference that lower eyelid surgery makes in their overall look. Without bags and puffiness beneath the eyes, patients invariably look more refreshed and content. To make the results of lower eyelid surgery even more dramatic, Dr. Robinson may suggest that patients undergo laser skin resurfacing in addition to eyelid treatment. Laser skin resurfacing can reduce the prominence of the fine lines and wrinkles that often contribute to the tired or aged look of those who require lower eyelid surgery. appearance of puffiness and bags. For less severe cases, there is a non-surgical lower eyelid option that we refer to as Lower-lid Liquid Lift or Under Eyelid Rejuvenation. Both of our providers, Dr. Robinson & Michelle Giglio, PA-C, specializes and teaches other physicians nationwide the delicate correction of the tear trough area with injectable fillers.